Feb 11, dinner. 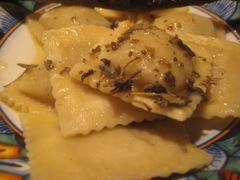 Mushroom ravioli with butter and sage sauce, and an asparagus. 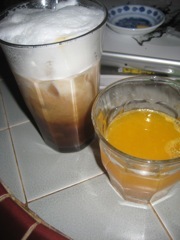 Feb 12, breakfast. The usual. Feb 12, lunch. 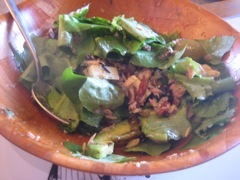 Small tuna salad. Feb 12, dinner. 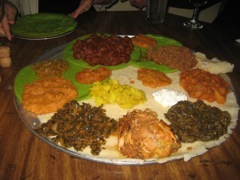 Zemam's with Rose, Mark, Jan. The bright green injeera are Rose's experimental ones. They were REALLY green. 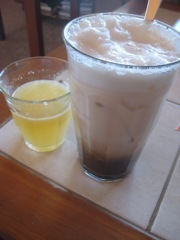 Feb 13, breakfast. The usual. Feb 13, lunch. 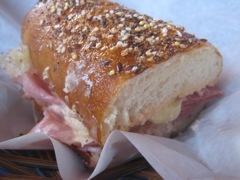 Half of a ham-and-cheese sandwich at Beyond Bread. With Jan, in Tucson. Feb 13, dinner. 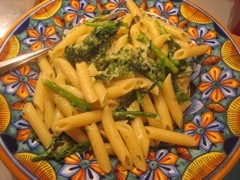 Brocoletti and penne. Jan is growing brocoletti, so I cooked it to soften it, and then made a very simple topping for the penne with oil, cheese, and the brocoletti. Good. Feb 13, dessert. 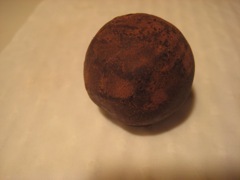 A truffle from Godiva. 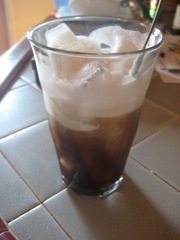 Feb 14, breakfast. The usual. Feb 14, lunch. 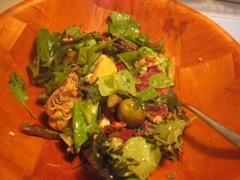 Salad from the garden, with artichoke hearts, sausage, olives, and leftover asparagus. At home with Jan.
Feb 14, dinner. 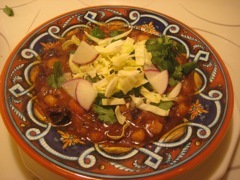 Joel's Posole. Sunday dinner at our house, a one-pot meal. Pork chunks, a mild chili sauce, and toppings of cabbage, lime, cilantro, and (most importantly) white onion. Delicious. 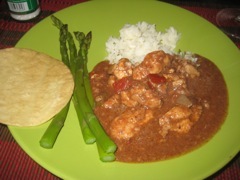 With corn tortillas. And the family, including Rose. 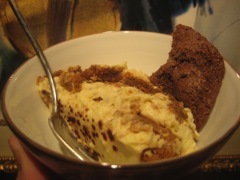 Feb 14 dessert. 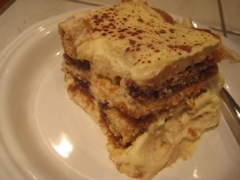 Joel's tiramisu. Standard recipe: eggs, sugar, mascarpone, lady fingers dipped in coffee, a bit of Benedictine, and sprinkled with cocoa powder. Very simple, very easy. I don't know why some people get all confused by this dish. Feb 14, dessert. 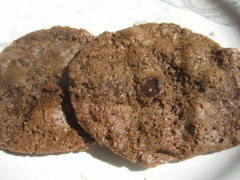 Rose's flour-free chocolate chip cookies. Made with almond flour, wow! 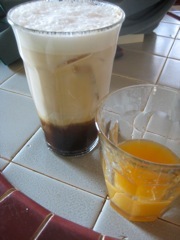 Feb 15, breakfast. The usual. In Tucson. Feb 15, lunch. 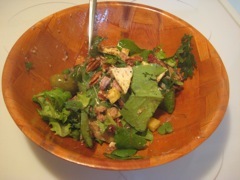 Salad of greens from Jan's garden, cheese, and other tuna tidbits. At home in Tucson. Feb 15, snack. 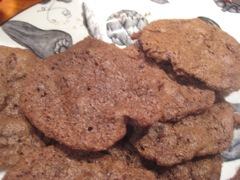 Some of Rose's great chocolate cookies. Feb 15, dinner. 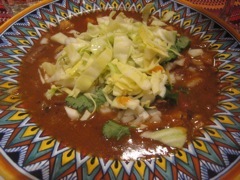 Pozole (or Posole, depending on how you want to pronounce it). From the freezer, but with all the fixins. At home. Feb 16, breakfast. The usual. Feb 16, lunch. 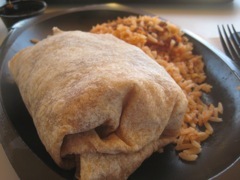 Burrito and rice. Feb 16, snack. 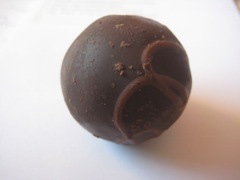 A chocolate truffle from Godiva. Feb 16, dinner. 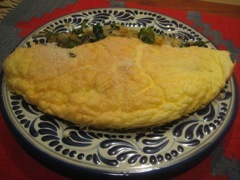 Frittata of leftovers and eggs. At home, with Jan.
Feb 17, lunch. 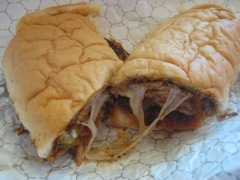 An Albequerque Turkey sandwich from Baggins in Tucson. A very good sandwich shop, although they haven't changed their menu significantly in about 20 years. Still, this sandwich is good, but I bet they get tired of making it. Feb 17, dinner. Chicken Molè by Chef Mark at Rose and Mark's. Outstanding interpretation of molè without being a slave to the canned taste you often find. Feb 17, dessert. Cheeses at Rose & Mark's. 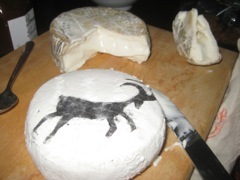 Goat's milk, sheep's milk, delicious! 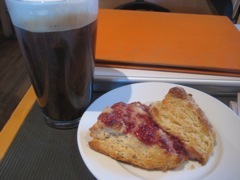 Feb 18, breakfast. 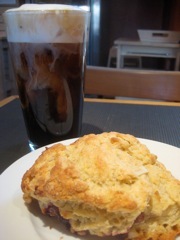 Cappuccino (iced) and raspberry scone at Raging Sage in Tucson. Feb 18, lunch. 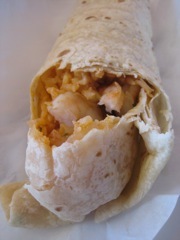 A shrimp burrito from Nico's in Tucson. Yum! Feb 18, dinner. Grazing at home. 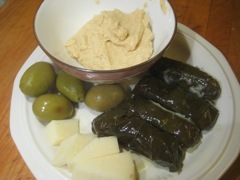 Some grape leaves, olives, a bit of hummus, and some cheese. A light supper. 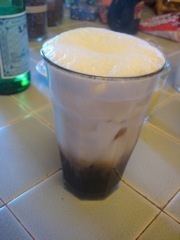 Feb 19, breakfast. At Raging Sage in Tucson. 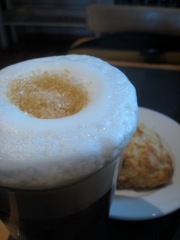 Cappuccino (iced) and a scone. Yum.